Seattle Now & Then: "This Place Matters"
NOW: For his “now” Jean wisely chose to climb a balcony on the building that otherwise would have blocked his view of the Homestead Restaurant. Jean will also be the “official photographer” next Sunday July 4th for the Southwest Historical Society’s “mass photo” of citizens showing their support for restoring the Homestead. 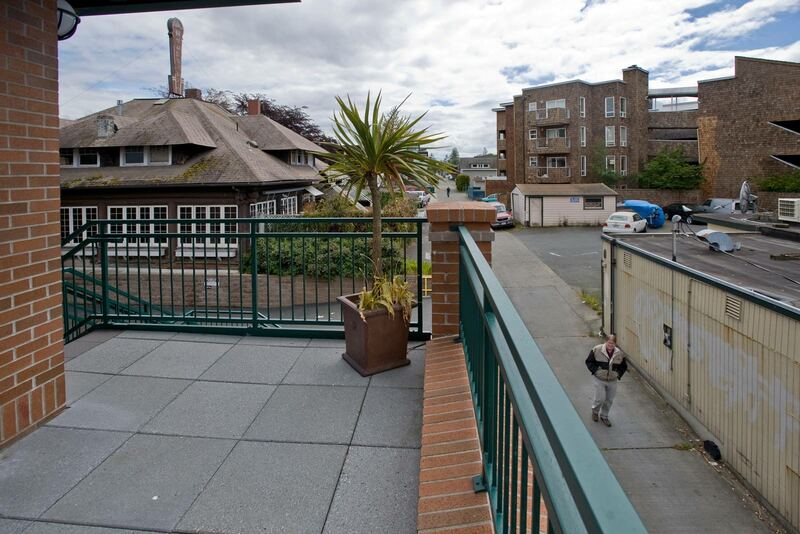 For that photo Jean will be hollering instructions from a prospect on 61st Avenue – not the balcony. Fir Lodge was built of Douglas fir logs in 1904 for a local soap maker, William J. Bernard, his wife Gladys and daughter Marie. 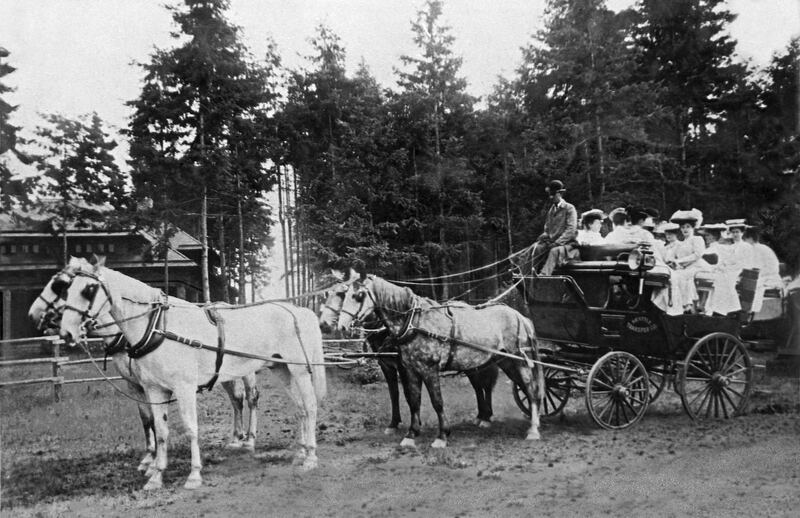 They stayed three years on Alki Point before returning to the city across the bay in 1907, ironically the first year that trolleys started running regularly from the West Seattle “pioneer” shoreline to Pioneer Square. 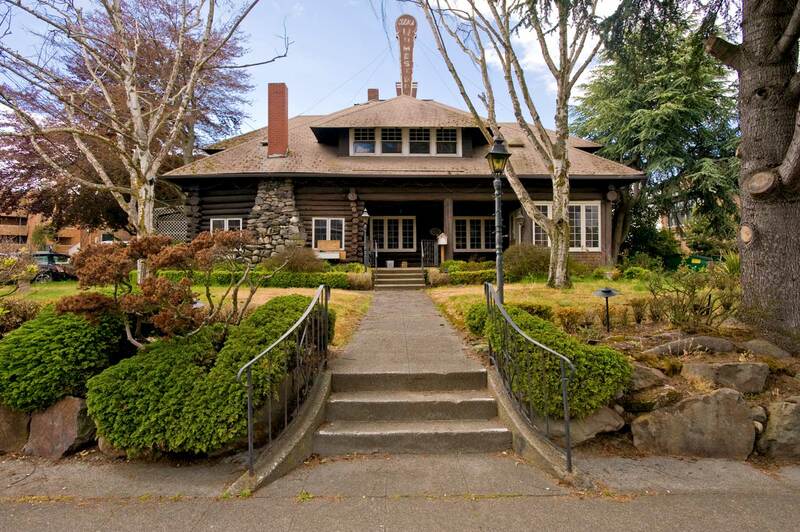 Of course, Fir Lodge was not the first “log cabin” built on Alki. That was the structure David Denny started building for John and Lydia Low and their four children in the fall of 1851. Fir Lodge was built to be rustic, but sumptuously. Certainly a good percentage of Seattle citizens and their guests visited it as the Alki Homestead restaurant, which opened in 1950 and became steady for its long run in 1960 when Doris P. Nelson purchased and ran it and devised the “family style” chicken-based menu that seemed as righteously American as the flag, mothers and apple pie, which the Homestead also served. I knew the zestful Doris and the energy she gave to both her landmark restaurant and the establishment of a home for the Southwest Seattle Historical Society in what was the Bernards’ carriage house and is now the Log House Museum. After Doris died in 2004, the landmark kept busy until the roof caught fire in January 2009. 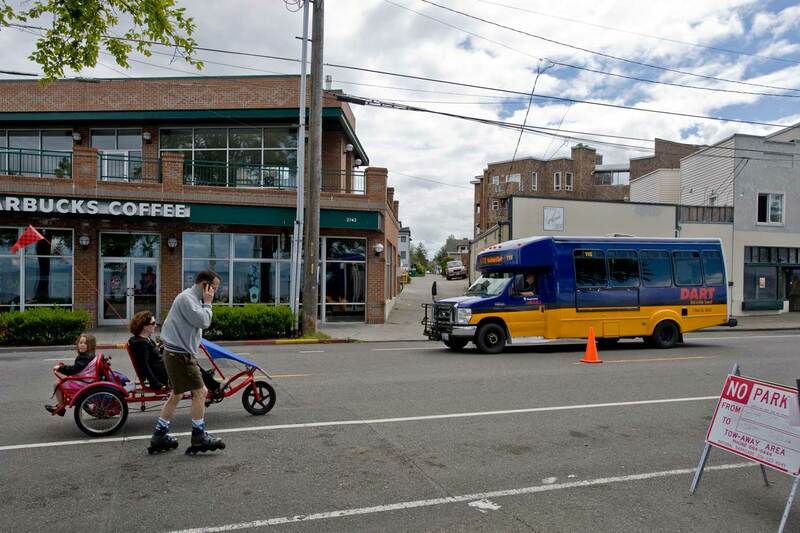 The Southwest Seattle Historical Society, which secured city landmark status for Fir Lodge in 1996, is staging a mass photo event in front of the now silent building on Sunday, July 4, to express continued support for its preservations and restoration. The photo will be used in a poster and distributed widely online. Restoration supporters are encouraged to be part of the photo, and those who do will hold signs that say, “This Place Matters,” a catch phrase of the National Trust for Historic Preservation. The photo will be taken shortly after 1:30 p.m. following the historical society’s annual all-comers Independence Day membership picnic, to be held one-half block south in the courtyard of the Log House Museum. Politicos who have signed on to be in the photo include King County Executive Dow Constantine, Seattle City Council member Tom Rasmussen and former Seattle Mayor Greg Nickels, West Seattleites all. Jean writes: While usually we try to position “Location Now” with “Location Then” as closely as possible, in the comparison above, a photo taken from the original photographer’s spot blocked the Homestead Restaurant completely from view. But for the exacting, here is a closer approximation of that view. Anything to add, Paul? Yes Jean – several things to add. FIRST I’d wished that you had reminded our readers that it is YOU who has been invited to take the GRAND GROUP HOMESTEAD RECORDING this coming INDEPENDENCE DAY. So now I have made a raucous note of it, and add that it is unique to see with what ease someone as monumental as yourself can easily gain the effective prospect for recording landmarks and masses. So readers please – if you will – come see Jean and get in front of his Nikon this coming JULY 4 (next Sunday and not this) at 1:30 in the afternoon. That is (how could this be not clear?) 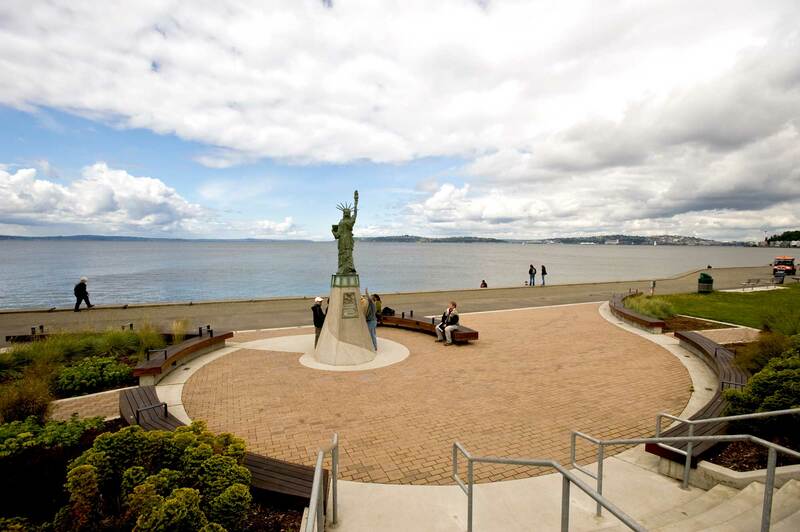 in front of the Homestead Restaurant at the Alki Point address of 2717 61st Ave. SW, and that is ONE-HALF BLOCK in from the STATUE of LIBERTY, which (back to Jean) you have shown us above in its new setting. Also below are two more examples of “NOW & THEN” out of old issues of Pacific, and both predictably related to the subject above. One is about the Homestead, published first in 1994. It prepeats some of the material used above. The other is about another log structure on or near Alki Point, the Sea View Lodge. The first of these also features a few more 1905 photos of the Homestead, inside and out, when it was a nearly new log mansion for the Bernard Family. Following the logs is an extensive and gentle parody on ghost-busters, and in this case vampires ravaging the cows of Moclips. Jean visited Moclips this evening as the speaker for the annual banquet given by the Museum of the North Beach. That vibrant roadside attraction broke all our records in book sales for “Washington Then and Now.” We are thankful, indeed we give thanks by making fun with them.